We changed our itinerary a little bit, as following day by day: Day 1: Meet at Guilin airport and transfer to hotel in Yangshuo. Day 2: Tour Moon Hill and Yulong River, Banyan Tree Park, Villages, farmer\'s house, Fuli old bridge, Dragon Village, Dragon Bridge. stay in Yangshuo The Moon Hill, climb up to the top of the hill via the stone stairways to see the panoramic view of countryside. 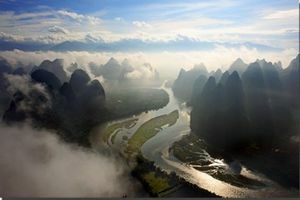 Yulong River is the biggest branch of Li River in Yangshuo, The pretty Yulong River is said to rival or even beat than Li River in terms of beauty. Visit Fuli Bridge is a nice stone arch bridge in Yangshuo with 30 meters long, 10 meters high and 5 meters wide, build in Ming Dynasty over 500 years old, it is the bridge that not many tourists visit and still keep very good moon shape, it is most beautiful old bridge in Yangshuo and a very nice place for who like taking photos, peace and tranquility. 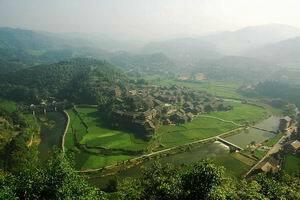 Here you can see duck farm, rice paddies, villages, beautiful upper reach of Yulong River and towering peaks. Day 3: Visit old town Xingping, Cruise in Li River in Xingping part, visit Fuli old town. stay in Yangshuo It is the oldest town with 1300 years history in the north of Yangshuo as well as the center of Yangshuo until the setup of Yangshuo in 590 A D. The old streets are paved in rocks, and the houses are made of stones with gray tiles. Cruise for about one hour and an half to see the most breaktaking landscape part of Li River. Day 4. Yangshuo--Longji rice terraces. stay in Ping village. Be met at your hotel at about 9 am, about 2 and half hour ride to Longji ( Dragon\'s Backbone) Terrace rice which looks like great chains or ribbons as they wind from the foot to the top of the hill. You can see different features of rice terrace in Spring, Summer, Fall and Winter and it is the most astounding in China. You will find nice wooden houses, long hair women with colorful clothes, heavy, silver hat and earrings, customs and lifestyle. Day 5. Transfer to Guilin airport Price per person: 1 person: $539 2-5 persons: $319	6-9 persons: $259	>9 persons: $215..
we did following itinerary: Day 1. the guide meet you at airport and transfer you to Guilin Hotel. Day 2. Guilin—Longsheng rice terraces stay in Jinkeng rice terraces. Shoot for rice terraces and ethnic group people at the rest of the day. Day 3. Longsheng rice terraces—Hebaoshan village. Stay in Hebaoshan village. Early morning sunrise photo at view-point 2, then drive to Hebaoshan We will make a climb up to the top of Xianggongshan to shoot of the panoramic view of li river in the afternoon. Day 4. 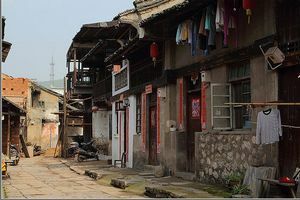 Hebaoshan village—Yangshuo. stay in Yangshuo Magnolia Hotel Early morning we will walk up to the top of Xianggongshan hill to shoot the sunrise of li river with peaks. After breakfasts in hotel, we will drive to Yangshuo, on the way we will visit Fuli old bridge, Dragon bridge and villages. We will drive to Gongnong bridge for sunset shooting or village in the afternoon. Day 5. Yangshuo---Xingping----Huangyao----Yangshuo stay in Yangshuo Magnolia Hotel. Early morning shoot at the most beautiful reflection of Li River, we will take the boat to on spot and shoot sunrise with fishermen, cormorants and lanterns for around one and half hour. This is the highlight of photo tour. Then drive to Huangyao Town with a history of thousand years, All roads paved by flag-stone, The old houses with blue bricks and black tiles, the aged banyan tree growing through small river, nice old bridges, temples, etc. Drive back to Yangshuo and stay overnight in Yangshuo..
We customized our tour to following itinerary: 5 Days 4 Nights Guilin Yangshuo Longji Rice Terraces Tour Day 1. the guide meet you at airport and transfer you to Guilin Hotel. The plan is depends on how much time you have, visit four lakes with twin pagoda. Visit the center city on your own in the evening. Day 2. Guilin—Yangdi—Hebaoshan village. stay in Hebaoshan village the guide will meet you at Guilin hotel and drive to Yangdi village, we will take the boat to on spot and shoot sunrise with fishermen, cormorants and lanterns for around one and half hour. This is the highlight of photo tour. Then will drive to Hebaoshan village. We will make climb up to the top of Xianggongshan to shoot of the panoramic view of li river in the afternoon. Day 3. Hebaoshan village—Yangshuo stay in Yangshuo Early morning we will walk up to the top of Xianggong hill for sunrise of li river and karst hills. Then drive to Yangshuo, on the way to Yangshuo, we can photography at Dragon Bridge, Fuli old bridge, villages and Yulong river. Take nap at the hotel. 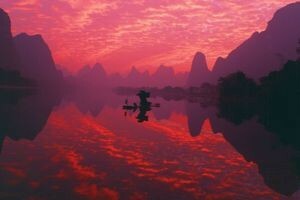 We will Shoot sunset at Li River or Yulong River. Day 4. Yangshuo—Longji rice terraces. Stay in the village. Transfer to Longji rice terraces. (Dazhai Rice Terraces) We will photo for sunset of rice terraces at Dazhai rice terraces. Day 5. Early morning, we will walk to the view-point 1 for photography of sunrise of rice terraces. Drive to Guilin airport for departure. Notes: there is about 2 hours walking distance from parking lot to Panorama Hotel, please pay the porters to carry suitcases for you. ..